Home :: News :: HEADS OR STARS? The Seven Kingdoms of Westeros have the usual sort of maddening medieval monetary system. No simple base ten nonsense here. 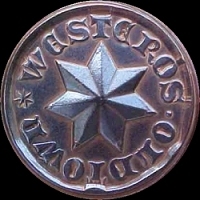 No, Westerosi coinage is more akin to old, pre-metric British money, with its pounds, shillings, guineas, ha’pennies, tuppences, and groats. No wonder Robert Baratheon hated counting coppers. You would too. And now you can have the chance. Will Whitfoot of Shire Post, who has long been renowned for turning out splendid Middle Earth coinage for Tolkien fanatics, has retooled his presses for the Seven Kingdoms, and will be issuing a series of Westerosi coins. He’s started with the copper, but silver stags will follow if there’s enough demand for them, and perhaps even a golden dragon. 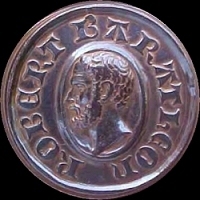 Will’s first Westerosi coin is a heavy copper produced late in Robert’s reign. It bears the king’s head on one side, and the seven-pointed star of the Faith on the reverse. You can add one to your collection by heading for Shire Post’s online shop at http://www.shirepost.com . One of these fat coppers will buy you a steaming bowl of brown in any pot shop in King’s Landing, with some ale to wash it down. On Earth, it will buy you… absolutely nothing.